The last few months of my life have been dominated by looming, impending, miserable final university exams. They are now done, and I am now free to turn my attention to the future and more cheerful things. What will life post-Oxford hold for me? I'm not sure, but maybe I should move to Switzerland for my health, Luxembourg to earn a lot of money, or Denmark for the best "life satisfaction". 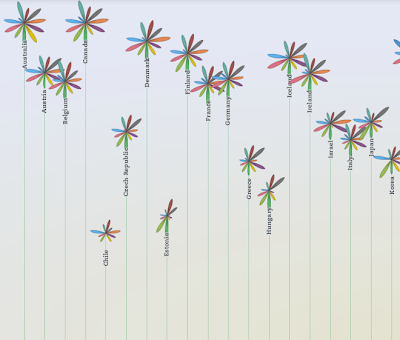 Go check out the beautifully designed and really interesting OECD better life index. Interactive, informative, fun. In a similar vein is the 2011 Global Peace Index. The video below runs through some of the big trends in global peace. Quantifying peace is a little like quantifying happiness - you can be happy in the worst place in the world and at war in your own home in the most peaceful country, but there's some nice stats here. You can go and take a more detailed look at each country here. And two sciencey videos to finish, because they are both a few minutes of visual loveliness. So should I move to Iceland in search of national peace or sit around and think about jellyfish in space? Time will tell, while my single ambition remains to spend my life doing things that I want to do. I want to be interested and entertained by what I do. That's possible, right? Soon I'll be rebuilding my personal website and looking at working on some personal projects, but for right now I'm pretty happy to sit in the sun drinking beers.